American politician. Vice President of the United States, 1968-1973. 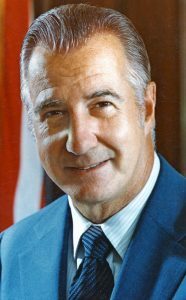 Spiro T. Agnew was elected Vice President of the United States in November 1968, serving under Richard M. Nixon. He served as chair of the 1969 Space Task Group that developed a long-range plan for a post-Apollo space effort. The Post�Apollo Space Program: Directions for the Future (Washington, DC: President's Science Advisory Council, September 1969) developed an expansive program that included building a space station, a space shuttle, a lunar base, and a mission to Mars (the latter goal had been endorsed by the Vice President at the time of the Apollo 11 launch in July 1969). This plan was not accepted by the president and only the Space Shuttle was approved for development. Country: USA. Bibliography: 535, 5090. 1918 November 9 - . Birth of Spiro T Agnew - . Nation: USA. Related Persons: Agnew. American politician. Vice President of the United States, 1968-1973. Oversaw NASA and post-Apollo planning..
1996 September 17 - . Death of Spiro T Agnew - . Nation: USA. Related Persons: Agnew. American politician. Vice President of the United States, 1968-1973. Oversaw NASA and post-Apollo planning..